Football Saskatchewan continues to grow and enhance tackle and flag football as a tool to promote skill development, position play, and teamwork for women's football. In football, self-discipline is emphasized through an interactive learning environment that provides growth physically, emotionally, spiritually, and intellectually. Flag football has been identified as an excellent opportunity for Football Saskatchewan to promote the game of football without the significant expense of purchasing equipment. With assistance from Football Canada and local flag football leagues, we are actively promoting the growth of female flag football in Saskatchewan. Evidence of this lies in the increase in the number of female participants in youth flag leagues and the start of the Girls High School Flag Football League in 2014. Tackle Football is also an excellent vehicle to promote the game of football among women. Two current Western Women’s Canadian Football League (WWCFL) teams are the Regina Riot and the Saskatoon Valkyries. 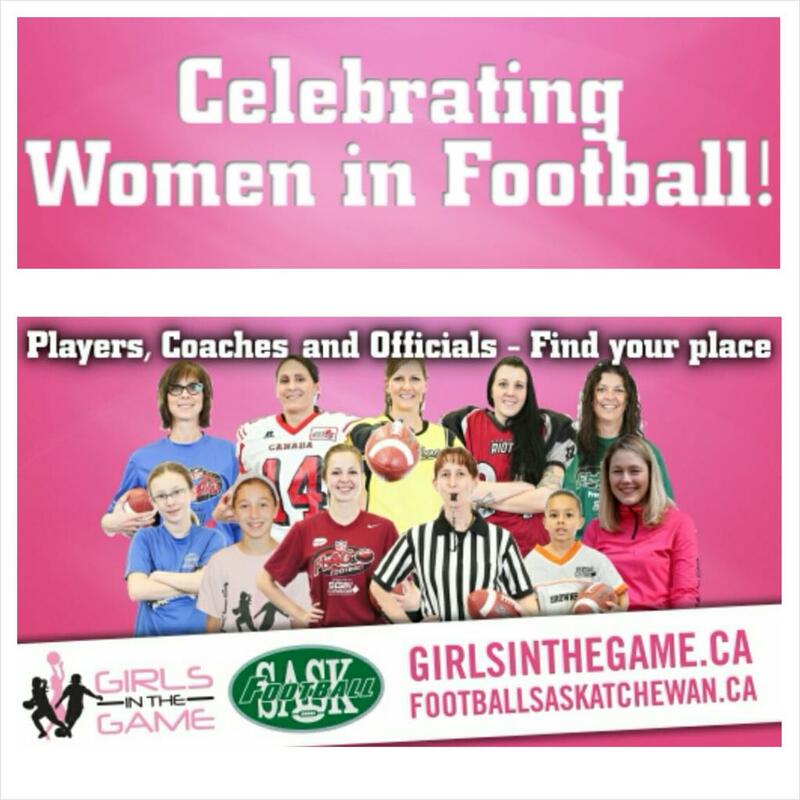 With the full support of Football Saskatchewan both programs continue to promote the sport of football to women of all ages. The Riot is Regina’s first women’s tackle football team. The Riot was first established in 2011 and has competed in the Western Women’s Canadian Football League (WWCFL) since its inception. The Riot finished first in conference standings in 2013, and placed second in the conference in 2011, 2012, and 2014. The Riot play in the Prairie Conference of the WWCFL, competing with the Saskatoon Valkyries, Winnipeg Nomads Wolfpack, and Manitoba Fearless. The Riot had 7 players compete with Team Canada at the IFAF Women’s World Championships in 2013, where they came home with silver. The Regina Riot are also highly involved in community initiatives and received the YWCA Women of Distinction Award - Circle of Friends in 2013. This involvement includes the Regina youth touch and flag football leagues, the high school girls’ flag football league, and local community school programs; Special Olympics floor hockey; Athletes Against Bullying; and the Regina Ovarian Cancer Society Walk of Hope. The Regina Riot Football Club exists to develop, support, and sustain an elite championship women's tackle football team – to train, compete, and win while developing quality leaders beyond the field. The Saskatoon Valkyries are the first ever female tackle football team in Saskatoon. The Valkyries are the current Western Women's Canadian Football League (WWCFL) champions and have been since the creation of the team and the WWCFL. In 2011 and 2012 the Valkyries had back-to-back undefeated seasons en route to winning the WWCFL Championship both years. In 2013 the Valkyries had their first franchise loss and went into the playoffs as the underdogs. However, true to their namesake the Valkyries came out on top in the end to earn their third WWCFL Championship victory in a row. The WWCFL, which like the Valkyries is entering it's 5th season, includes teams from Alberta, Saskatchewan and Manitoba. As of the 2013 season these teams are the Edmonton Storm, Calgary Rage, Lethbridge Steel, Okotoks Lady Outlawz and the Grande Prairie Northern Anarchy who compete in the Western Conference, and the Saskatoon Valkyries, Regina Riot, Manitoba Fearless and Winnipeg Nomads Wolf Pack, who compete in the Prairie Conference.